The Strong hat is another pattern in the Affirmation collection (which also includes Achievement). In this case, it is not a lace stitch pattern which is inspired by a positive word but a colourwork pattern. As the name suggests, the pattern is inspired by the word Strong. The pattern is written for one size, to fit an average size woman’s head with circumference of approximately 22”. 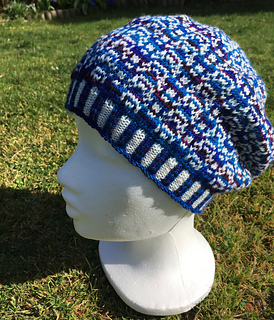 The hat band itself measures 18¼” (46.5cm) around when knitted to pattern tension of 7st and 12 rows per inch (2.5cm) over two-colour rib as given for band.